It can be difficult to afford a sizable home these days and young people who want to purchase homes have to be content with smaller spaces. However, this doesn’t mean that you can’t decorate your tiny apartment well and maximise all the real estate you have. 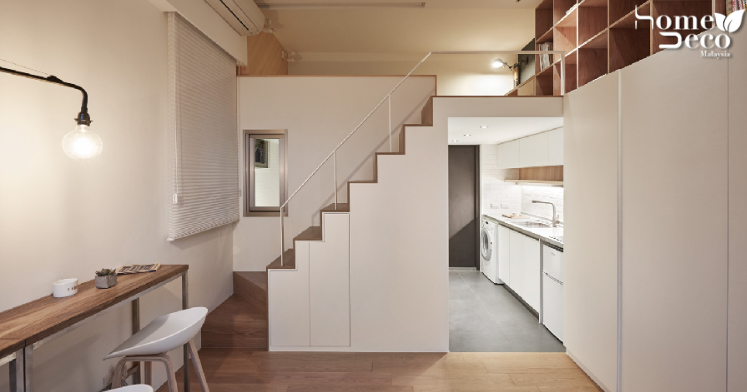 A Little Design, an architect firm in Taiwan transformed this 236 square feet home into a thing of beauty that works great for permanent living. Keeping the style minimalist and modern, there is barely any decor you can see in this cosy home but it looks stylish thanks to the white palette that gives an illusion of space. This is complemented by the warm neutral tones in the home that comes from the wooden elements which make it look really neat and sophisticated. It also has high ceilings which makes it look much more spacious and a loft bedroom was created so that the space below can be put to good use. The living area is fitted into a small alcove where a big window lets in lots of natural light and is a cosy nook when you just want to chill out. There are plenty of hidden storage options and floating shelves easily accessible by the slim sliding ladder so you don’t have to worry about not having space for your stuff. The dining area is two thin console tables that can be used as a breakfast bar or pushed together to become a dining table. The bathroom and kitchen are next to each other while loft bedroom is located directly on top of the bathroom for a semblance of privacy. It is all decked out with minimal fuss with barely any furnishing but this gives it a neat and stylish look because sometimes you just need something simple. All images from Arch Daily unless otherwise stated.